Phones are the new cameras – well, that's at least what Apple wants you to believe. But for your iPhone to start really acting like a camera, it needs a little accessory help – starting with a decent tripod. To help you choose the right option, we've compiled this list of the best tripods for your iPhone that you can buy right now. You see, smartphones are designed and built to be supremely portable. They can slip into a spare pocket and they're always ready to capture the finer points of life, in either still or moving pictures. But even the best camera phone has movement which, when you’re shooting, can be highly undesirable. It’s all too easy to end up with wobbly video or blurry photo due to slow shutter speeds in gloomy lighting conditions. One solution for stills is to use a phone’s built-in flash, but image quality tends to take a sharp turn for the worse. A better idea is to use some kind of stabilising support. Naturally, a traditional tripod is somewhat at odds with the slim-line, compact nature of shooting with a phone – but there are plenty of adapters on the market that enable you to mount your phone on a tripod if you so wish. Originally designed as a tabletop tripod for cameras weighing up to one kilogram, the GorillaPod PIXI Mobile Mini is available in black, red or two-tone red and grey. When closed, the fold-out legs enable a comfortable and secure handheld grip, and they open out to give a solid support. A neat push-button (bearing the Manfrotto logo) enables you to release or lock the clamp for the pivoting ball head. The tripod is also available as a kit, complete with universal smartphone clamp, which we’ll come to next. Manfrotto markets its PIXI mini tripod and universal smartphone clamp as separate items, but it generally works out cheaper to buy these two items as a complete kit. As such, you’ll get the tripod itself, which comes with an integral ball head and is suitable for use with cameras, plus the smartphone clamp, which attaches via a standard 1/4-inch socket, and can accommodate phones of up to 83mm in width. It’s a good solution, but the limited range of movement for the ball head means you can only shoot with the camera in landscape orientation. The cleverly designed Manfrotto TwistGrip universal smartphone clamp folds virtually flat for stowing away. You simply twist each end to pivot the clamping jaws around, so they can attach to any phone of up to 82mm in width. The clamping action itself is nice and solid, thanks to a locking screw at the rear. Immaculately engineered from high-grade aluminium and coloured dark grey, the TwistGrip looks and feels a quality item. It can mount on any tripod via its 1/4-inch screw socket, and has a cold shoe at the top for attaching accessories, like the Manfrotto Lumimuse LED light. 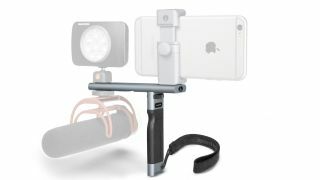 This two-piece kit comprises a handle and ‘accessory bar’ for Manfrotto’s TwistGrip universal smartphone clamp. The grip secures to the clamp via a 1/4-inch tripod thread, but you can also use the accessory bar horizontally between the two. The latter T-shaped configuration enables you to add one or two other accessories like an LED light and microphone, via two cold shoes. The components are well made from high-quality aluminium and rubber-grip surfaces. Overall, the Manfrotto ergonomic handle and accessory bar for TwistGrip adds versatility and natural handheld usability to the TwistGrip. However, you’ll still require a separate tripod for anything other than handheld shooting. With suitably small and phone-friendly dimensions, the Joby GorillaPod Mobile Mini weighs in at just 32 grams. It’s also Joby’s cheapest ‘tripod’, yet features the company’s typical flexible legs, constructed from a series of movable joints. As such, you can stand it up like a mini tabletop tripod, or wrap its legs around other objects to cling onto them. It comes complete with a phone mount so it’s an all-in-one solution. The only real drawback is that each leg is only 60mm long, so you can only attach this relatively small GorillaPod to fairly thin objects. Unlike Joby GorillaPods, the Joby GripTight ONE Micro is a tabletop tripod with rigid, non-flexible legs that swivel around. This makes the whole tripod very small and slim when folded away, while enabling a secure base when the legs are fanned out for the standing position. It’s a neat and very streamlined design, the only catch being that the operating height to the bottom of the phone is only about 30mm. Although there’s no height adjustment, the main clamp does enable you to pivot the phone forward and backward and from side to side, albeit with a fairly limited range of adjustment. You therefore can’t use the phone in upright, portrait orientation. The relatively long legs of this GripTight GorillaPod have nine flexible joints. That’s a significant step up from the GorillaPod Mobile Mini, and enables greater height when using the stand as a tabletop tripod, as well as allowing you to wrap the legs around larger objects, such as tree branches and fence posts. On top of that, the ‘Magnetic’ edition also incorporates magnetic feet, so you can easily attach the GorillaPod to anything metallic. The phone clamp is the same one that’s featured in the GripTight ONE Micro Tripod. This chunky GripTight GorillaPod Stand PRO gives very stable and solid support for smartphones and comes complete with an up-market phone clamp. It features a locking screw for adjusting the clamp to the exact size of the phone, and this screw also enables rotation for portrait and landscape orientation while shooting. However, a little care is needed to ensure the clamp doesn’t loosen its grip on the phone during rotation. It’s rather bigger, heavier and stronger than smaller GorillaPod siblings, but is still good value at the price. If you unscrew the phone clamp, the legs are also suitable for use with a compact camera or small DSLR. The sophisticated GripTight PRO TelePod can be used in many and varied ways. The comfortable hand grip has three longitudinal sections that hinge out to become a set of tripod legs, with two operational angles on offer. The centre column extends, with three telescopic sections that lock and unlock via a simple twist mechanism. Up on top, there’s essentially the same versatile head as featured in the GripTight Gorillapod Stand PRO, but this time a cold shoe is added, which can hold an LED light, microphone or other accessory. The kit also includes an ‘Impulse’ wireless remote shutter button, which connects to most iPhone and Android smartphones via Bluetooth. Specialists in binoculars and spotting scopes, Vortex Optics also manufactures this novel mount for fixing to a semi-open car window. The idea is that you clamp the lower section of the support to the window, and the upper section acts as a regular tripod head, enabling pan and tilt functions. The Vortex Optics Car Window Mount works with cameras and any scopes that feature a standard 1/4-inch mounting socket, but you can just as easily add any phone clamp that has the same attachment thread, like a Manfrotto TwistGrip universal smartphone clamp, or a Joby GripTight ONE mount.